State of Decay 2 Xbox One Release Date, Pre-orders LIVE! Pre-orders for the anticipated release of the State of Decay 2: Ultimate Edition (Pre-Purchase/Launch Day) – Xbox One [Digital Code] are LIVE at Amazon! 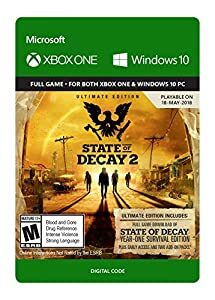 State of Decay 2: Ultimate Edition includes early access to the full game four days before the standard release date, a code for the original State of Decay: Year One Survival Edition on console, and a code for two add-on content packs*: Independence Pack and Daybreak Pack. *Add-on packs available as released, see xbox.com for updates. State of Decay: Year-One Survival Edition only available on Xbox Console. has a scheduled release date of May 17, 2018. Download the game on 5/3/2018 at 9 PM Pacific Time. Game will be playable on 5/17/2018 at 9 PM Pacific Time. Previous PostPrevious Amazon Xbox One Digital Video Game Blowout Sale LIVE! Next PostNext Call of Duty: Black Ops 4 PS4 Xbox One PC Release Date, Pre-orders LIVE, Includes BETA!